I went out with Flicka this morning. She was given to me by a neighbor who was moving away and could no longer care for her. She’s four, and when she arrived, she was untamed and full of fear. It took two weeks before I could touch her. I’d sit on the fence and just be present as she and Ranger and Mike’s horse Kota ate, and as they rested in their serene, secret meditation. I’d brush Ranger and Kota, ignoring her physically but talking to them all; she watched me, and watched how Ranger and Kota – who she had come to trust – trusted me. Then one day, as I stood amongst them, brush in hand, she slowly approached me. She stopped right in front of me, facing me, then lowered her head slightly and brushed her cheek against my cheek. And then she stepped forward a bit more, broadside to me, with her shoulder at my torso, as if to say, “you can brush me now, and please start here.” And so I did. Flicka is richly, divinely beautiful ~ she is the Elizabeth Taylor of horses. And when she moves, the sight makes me catch my breath in a secret smile. When she and Ranger and Kota race the length of their field, she is always far in front. Her hooves seem to barely skim the ground ~ it is not a choppy gallop she has; her body hardly seems to move as she shears effortlessly across the landscape. She is the only other animal I have seen who moves with the impossible speed and grace of a coyote. I thought about this off and on throughout our walk, and as we were closing the loop towards home, I thought perhaps it’s because animals have no ego. And to work well with an animal, it is a requirement to have no ego yourself. And I love that state. It’s a requirement for true art, as well. (Art, to me, being the act, the transcendence which occurs in the doing, not the “product.”) People, on the other hand, are so often dominated by ego. Sometimes, it is so hard to remain without ego when surrounded by so much of it; sometimes it feels lonely to witness so much energy spent maintaining something that is, ultimately, false: it’s such a contest, but it’s all smoke and mirrors; nothing is ever won, and so very much is lost. wow,S. Flicka’s color is incredible. and what an amazing photograph. wow. Please tell us how you “broke” her. She must be a dream to ride. I’m a counselor (and a librarian). The problem with people is that they carry all their emotional baggage, their relationship and personal history, everywhere they go. Animals, on the other hand, live in the Now: no regrets or anger about the past and no worries about the future — and always, always forgiving. I’m so with you on the patience with animals vs. humans thing. I rescued a completely feral kitty a bit over a year ago. It took a very, very long time but she now trusts me and will come when I call her, headbutt me for scratches, and purrs nonstop. I’d never put that much effort into getting a human to come around. to gain the trust of such a magnificent animal is quite the rush…and privilege. i love that you know the feeling on several levels. Shreve, what a wonderful story and beautiful pictures. I totally agree with you about patience. Shreve—quick question—do you “do” treats with your horses? The horse culture I was raised in, we always gave them apples and carrots, but I know some people don’t use them. Sorry Shreve, I don’t like the word “break”. I know what you mean however so my offense is short lived. Training and bonding with a horse can be some of the most exciting things that can happen to you. Research “joining up” with a horse – it’s where your horse thinks you are a part of its herd and will follow you to the ends of the earth. I think you are already part way there based on your description. It is amazing thing to walk around with a 2000-lb horse following right behind you (without a lead!) – When you stop and the horse breathes on your neck and nudges you to say “let’s keep it going here.” Absolutely amazing. It also helps with the training. You’ve now reached the ultimate trust with the animal. I ~ yes, they love apples – but I’m not regular about giving them treats, it happens when it happens, you know? and I think I’ve finally found some non-GMO grain nearby… fingers crossed! Again, this is beautiful, thank you for sharing! The beauty of this is, that once that trust and love is established with an animal, it is unconditional. Sadly with people, that is not always the case. I think you are talking about the negative ego in people, the positive ego is needed in a productive life. Thank you for sharing that beautiful horse story! Thank you for so eloquently sharing such a simple yet transformative ideal. I get it. I really do. And would love nothing more than to shatter the mirrors and blow away the smoke to live side by side with beautiful creatures like Flicka and humans who do not put ego foremost in daily life. What a beautiful horse! And what a beautiful and poignant story! Thank you for sharing. There is little in life as touching and powerful as gaining the trust of a fearful animal. That communication transends all logic and science! Now that you have that tender trust between you, I would like to suggest that you continue to develop it by using “positive reinforcement training” much like is being done with dogs. My daughter is doing this with some horses and has found it to be a highly effective and nuturing way to “break” a horse (which is a TERRIBLE term! )I wish you a long and happy relationship with Flicka! When I first saw the picture of Flicka, I was astounded by what a beautiful horse you presented us with. Thank you. She looks so much like my Felicity I parted ways with so many years ago, sigh……. Flicka is a gift from the Universe. I am relieved she will not be “broken,” but kindly taught what you would like of her. If you can sprawl your body on a bull’s back, you have it in you to work with this mare while keeping you both safe. I have also found myself going within and spending time with animals (volunteering at an animal shelter for several months now) and find myself more easily suspending judgment. In fact, I am happy to back away from the complicated negotiations of human relationships to be closer to the art of living. Well written–this one will live with me. Flicka is a beauty. Animals are more intune with their senses. They are “real.” Few humans are really themselves around others — hence the “ego” issue. Love you pics and stories of your family. She is stunning. What a beautiful girl! Bliss is what a person finds when bonding with an animal. I think Miss Flica is finding her bliss with you. Nobody who cares about horses “breaks” them anymore. Only cruel people do that or even say it. Your beautiful, beautiful Flicka will follow you anywhere, do anything for you because you ask and don’t demand. Beautiful and if the photo is accurate, a flirt. Animals are innocents . . . I’m with you on the “patience with animals” – and not so much with people. Lovely sentence in a lovely piece. I think the late Miss Taylor would have felt honored by your tribute. I agree and identify with Shreve, but I think we have to be careful with this attitude. We need people who are patient with others in order to help people grow and transcend their egos. For the youth, at least, we need counselors and teachers and parents and leaders who *won’t give up on them* just because they are frustrated. This is how you make people let go of the ego they defend so strongly, when they realize someone will stick with them, values them, sees beyond the ego, and that there might be enough to love in themselves and others that they don’t need it. Of course you take responsibility for your own growth, but having people out there like this sure helps you along. Anon ~ Of course. Sometimes recognizing the “why” makes it easier to overcome (at least for me). Wonderful post. Shreve, you are a special gift. Glad Flicka is part of your farmily. *Sigh* Beautiful post and an absolutely beautiful horse. As for animals vs. people–and I say this as a crazy animal person–I think that animals can be easier to deal with because it’s easier for *us* to be ourselves and responsive. I’ve been in some high-tension people situations where I’ve used the same strategies I would with a stressed animal (relaxed body, soft gaze, etc.). And it works beautifully. But it takes that giving-up-of-self that we typically reserve for animals. Honestly, I can’t imagine what it would be like to be that tuned in with people all the time. (I suppose good therapists do it by the 50-minute hour.) But I do think we make a mistake to divide “animals” from “humans.” Civilization has done a good job of making us appear to be separate, but we’re all really just creatures. . . .
What a beautiful post Shreve..and how lucky for all of you that she has become a member of your farmily..I wish you many years of companionship with Flicka, and what a beaut she is! Thanks Shreve, amazing post! You are definitely continue to be an inspiration to me! Great post and I totally agree with you about having more patience with animals then people. I am the same way. Many of our dogs, cats, and birds are rescues and they have grown to love and trust at least us. I do have one dog that is entirely loyal to us, but hates strangers. He will bark, growl and make attempts to attack stranger and where I can’t trust him with anyone but us, I completely trust him with us. He knows what love and trust is and will protect it at all costs. If only humans had that attitude there wouldn’t be so much violence and divorce. I love the horse posts!! How did you learn to start a horse? I’ve had people ask me to start their horses and I always decline because, altho I know how to handle them on the ground and in the saddle, I’ve never actually started one and don’t want to screw up. I agree about the ego thing and people. You bloggers are inspiring me this morning… Did you all get together and conspire to make me *think* this early in the day? Thank you, Shreve. And since Jon Katz doesn’t open posts on his blog, I’ll thank him here, if you don’t mind. Thank you, Jon. Shreve, what a wonderful post and I do believe you are right. It is ego that seperates the good stock people, animal trainers etc from the rest. As I read your post I could picture all the instances where ego got in the way of good animal handling. Wonderful post! I’ve never been able to put my finger on the reason I enjoy animals so much more than most people. Actually I could list a hundred reasons but their lack of ego is the root of them all. Thanks for that, Shreve. I can now be much more succinct when asked why I choose the life I do. Why can’t people just say “saddle train”? I think “broke” is the height of ego as in “little ole me forced big mean horse to do MY will”. We leash train our dogs, potty train our kids so it shouldn’t be a big stretch to say saddle train. Poor Ranger, first the bull now Flicka, someone’s nose is really going to be bent out of shape. The nice thing about love though is that the more it’s given out the more it comes back. @ Marg (and everyone else who doesn’t like the term “break” – I believe people use the term so often as it has been around forever, and used by non-horsemen and horsemen alike. The change to using a different term is therefore slow but it IS happening. One of the words beginning to be used is “start”. To “start” a horse is to saddle train it. It’s a nicer word and actually more descriptive of the process anyway. You “start” a horse by saddle training it, and “finish” it by many, many hours in the saddle and fine-tuning the partnership between horse and rider. Ah, thank you Coral!! You say it perfectly! Lovely post! Like you, I have infinite patience with animals, but very little with people, especially children. I never thought of it in terms of ego-state, but that is certainly something to ponder… it feels right. When I work with animals – even when it’s hard work and frustrating and seems like no progress is being made – it still feels like meditation. Congratulations on winning the trust of yet another wonderful creature! Elegant, deep-chocolate velvet royalty, and you captured her perfectly. Perhaps she had a short course in “how to pose for a photograph” before she was gifted to you. It must take your breath away to watch her run with the same light grace of Charlie and the deer around your property. Perfect musings on ego; I identified immediately. I hope you take a look at this method. Best Friends Animal Sanctuary, largest no kill in the US uses this method. No need to “break” a horse. Good luck. Again, a beautiful story beautifully told. You keep surpassing yourself, Shreve, as a writer. As for Flicka, she couldn’t have asked for a better partner than you. Over the years, I’ve fostered all kinds of dogs rescued from all kinds of situations with all kinds of “baggage,” and I’ve always found that even the most terrified animals eventually respond to kindness, calmness, and a soft voice and hand. You did the exact right thing for Flicka by having her watch the others interact with you and letting her decide to come to you when she was ready. Now you can build on that and your relationship with Flicka will continue to blossom. Welcome, Flicka, to the Farmily! Oh my, Flicka is beauty. And I LOVE your post. It seems to me that animals can teach us much, remind us what’s important, without being all preachy about it. So besides the enjoyment of spending time in their wonderful company, if I’m open enough, I might absorb some insights about being a better self. The self awareness I gain when I’m with my mare, Cheyna, is not won easily but is so valuable. And the loving she shares is precious. Congrats, Shreve, on welcoming a mare into your life. Their energy, intention, and focus is so different from a gelding’s! Hi Shreve. I’ve “started” 5 horses in my youth. If you have the patience, and it sounds like you do, take as long as needed for flicka to trust you completely. I have some unsolicited advice. Here’s what I did. While you are leading around, use voice commands: Halt/Whoa or walk, or cluck. Once she recognizes these commants, she will be much easier to control once you are up in the sadle. Once comfortable in a halter and lead, start by moving (swinging/semi flapping) a sadle blanket around the body. Continue til she no longer spooks. it may take a few days. Then practice putting the blanket on the back, take it off, repeat until she no longer spooks. it may take a few days. Then do the same with a sadle. Then try a bridle (traditional/hackamore/bitless). put on. take off. repeat. try walking around with the bridle. Continue til she no longer spooks. Then dress her all up in sadle and bridal and put weight in the stirrups. repeat on both sides. Then put your leg in, and rise up leaning over sadle. step down. repeat. Continue til she no longer spooks. By the time you swing your leg over and sit atop, she’ll be cool and probably not even buck. And look at you wondering what took you so long. Then you just need try walking forward :-) Use your voice commands to start and stop, along with your heal and reins, and take it from there. People sometimes think this is funny but it works, sing when you ride or hum a tune. It will help calm her. By this time she’ll trust you completely. You’ll be partners. After you both get this down, perhaps mike can shake a bag or something to make noise while you ride. Make sure you have a “deep seat” before he starts. This can desenitize her to startling stimuli and help save your neck. Its called “bomb proofing” a horse. No greater tribute than having gained the trust of another animal. Touching tale, but not surprising. What a timely (and beautiful post). I’ve been having a power struggle with my boss, and this has reminded me to question my true motivation: that I’m right? or that it’s done well. 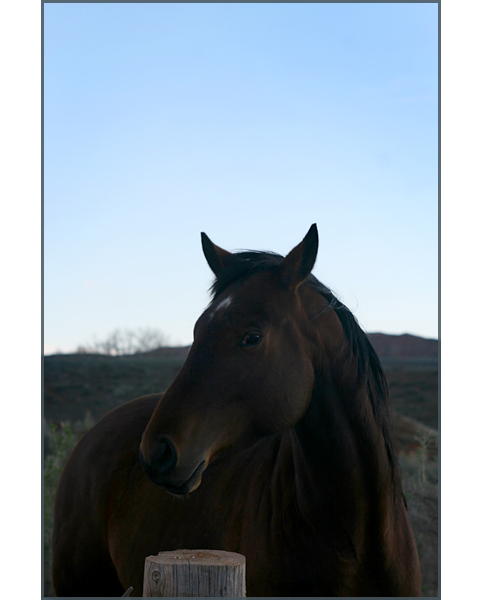 I love Flicka’s portrait – she is certainly regal! :) Scanned the comments to make sure you knew about Monty Roberts and someone already provided the link to his site. Your readers are awesome! I’ve seen Monty in person and it was one of my most memorable animal experiences. Hell I didn’t even have a horse at the time but will carry his lessons with me forever. Best of luck with your bonding. From what I’ve read these past couple of years, you’re a natural. Shreve, this is one of the most elegant posts I’ve ever read from your blog. Thank you for this. You are a true gift for us. Welcome Flicka, to the Farmily! When I first saw the picture of that unknown horse… my breath was taken away. After reading her/your story, I felt even more breathless. Flicka is a stunningly beautiful horse. And such a lovely presentation – dark horse, in early or late half-light against dark hills, a warm and soft being in a cool photo and a regal stance. (I liked the comment that she looks like silk!) And to compare to your portrait of Ranger, in sunshine and breeze, all white/gold/red on reddish ground. Just lovely, so lovely. I was leaning toward the phrase, to ‘gentle’ a horse, but I see that’s been well covered, and I look forward to following up on the links suggested. Thanks as always for your insight, Shreve, and your beautiful images. Flicka is a gorgeous horse. Is she full Quarter or Appendix? I have been involved in horse breaking as a child. However, more recently a new friend introduced me to natural horsemanship. I always though this was just trendy thing but watching her do ground work with her horse who is trained in natural horsemanship methods. I was amazed. All the best to you. almost cried reading this too! gads I love horses and miss them so…their beauty and strength can be intoxicating. thanks Shreve-I love this post. You are incredible. I love your writing, your your patience, your pictures, your wonderful animals, your site. I found you after reading your book the Daily Coyote. Yes, I loved that too. Thank you for it. And now I miss my horse. Ahhhh. Shreve. You have captured what those of us who love animals, know. We may come to it in different ways, but when we get there? We know. I think that is why almost everyone here that posts in response to you when you write of things such as this—says something I wish I’d said, but I know we all come from the same place. A love in our hearts for these dear sweet animals that would take your breath away if they were but for a human. I know as a mother of humans (ha) I feel that push and pull of love and anger (they are boys after all) but for my animals? I never did. It was always pure joy, pure love. And I knew that they knew, and we could respond in a dance that I’ve never done with ANY of the people I’ve had in my life. Flicka is so beautiful. To get the trust from a horse is so powerful, I adopted a mustang from the BLM and it took 2 month before she would eat out of my hand (I cried when it happened)and 4 month before I was able to touch her. She had slipped her halter and drag rope and nobody could get close to her. I would spend hours in the round pen and in her stall just watching and talking to her. Now I can kiss on her and hug her and I love her so very much. OH Shreve she take my breath away!! I so needed to read this post exactly when I did. I love your stories. Thank you so much. I’m so much calmer after dealing with the inflated egos of the past few days, you have a gift. This post makes me want to sell everything I own and buy some land in the Rockies. It’s funny, while most people balked at your use of the term “break,” I balked at the idea that animals don’t have egos. I guess it depends on how you were defining “ego” — in the Freudian sense I would say animals have no super-ego, moralizing and criticizing, but I do think they have organized thought (his definition of ego) and are not pure “id.” Or perhaps you meant it in the sense of cockiness — but having seen my dog lord it over another dog when she steals its toy, I wouldn’t call her behavior pure innocence! I know I’m picking apart your post, and I apologize because I think I understand what you’re getting at. I think the biggest cause for our patience and tolerance of animals that is not present in humans is their willingness to accept (or at times, reject) you completely as yourself, without negotiation or judgment. Humans always seem to want to meet halfway — there’s beauty in that and there’s an obnoxiousness to it too. Animals will hold a mirror up to us time and time again, but they won’t draw on that mirror or comment on the reflection. Maybe there is an aspect of innocence in that, but it’s not without ego, it’s with total acceptance of it — theirs, yours, and so on. So well put, so insightful, and soooo right! A stunningly lovely animal, in several senses, from the image and the way you describe her. I haven’t ridden since I was a teenager, but I can appreciate what a skilled horse and rider can do as a team. What you say about animals and people rings true. We’re social creatures, so our social constructs can grow to overwhelm other aspects of our lives. While animals can also be social and hierarchical, they rarely let that interfere with the simple business of living. Maybe it’s the difference between Doing and just Being. She is absolutely F A B U L O U S and I love her! 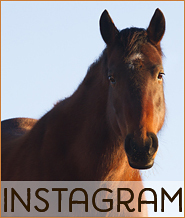 i love when you share photos/stories about your horses. they are such majestic, yet fragile, beings. simply beautiful. Thank you for sharing your horses with us. It is difficult for me to verbalize exactly why my horses are worth all the time and money I spend on them but they are so much fun and they make me happy. I truly believe that Ms. Taylor is honored to be associated with Flicka, and is smiling down on her. I so enjoy reading your blogs. So beautifully written, I had tears in my eyes. I currently work with dogs, and I have tried another job and quit it to come running back to being around 30 dogs a day. There is something so peaceful, I feel they teach me more about life than humans ever could. And to Elise, I do agree. I think what Shreve was getting at is they so lack the self consciousness that humans tend to obsess over. At work, I have dogs who were best buddies who all of a sudden want to kill each other, and then after a few weeks they are fine. They definitely have attitude. Oh, Shreve… this gave me shivers – the trust of an animal is a precious thing, a special gift. Beautiful post, Shreve. And a gorgeous horse! Lovely photo and story about Flicka’s progress in your care. I met the lady who runs this sanctuary for horses when she exhibited some of her artwork at the library where I work. Some interesting information about working with scared horses, and some great art! Hope you will visit it. Aaahhhh, that sweet communion with a horse. Precious beyond words, but you do an amazing job of putting it into words! That moment when Flicka touched your cheek with hers took my breath away. I can scarcely imagine how you must have felt. Beautiful story! Did you give her that name, “Girl”? I’m very struck with how much it is about time. I don’t argue with the amount of time it takes to get close to an animal. It just does. But somehow I don’t have that kind of time for people. It’s also because people are so *loud* in their psyches. Animals are quieter, even if they’re needy. I do Reiki on animals, and horses are the most responsive. They come right up like you describe, then offer the part of themselves they want work on. They are such a still pond, rippling with any stimulus. Amazing. Your horse’s beauty, as I previously mentioned, and I don’t know where the post went; it didn’t go here, is breathtaking. 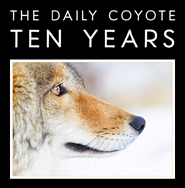 Your lovely coyote and all your wonderful animals have afforded you the luxury of not having, at least only at the bare minimum, to interact with humans. You are oh so fortunate, and I know you do appreciate that. Humans, the ones I have had the misfortune of having come in contact with, are mean, ignorant, stupid and obnoxious. And I don’t believe it is just the particular area in which I am living at the moment. Of late, it is universal. No one gives a rat’s deriere anymore what kind of job they do, if they please the customer, but they do want your money. I lost my granddaughter at the hands of an inept and contemptible buffoon from a hospital that prides themselves on being Number Six in the nation – though they have been riding on the coattails of a past (doubtful) stellar reputation for some time now. But my philosophy began long before that. My granddaughter had Cerebal Palsy and NO ONE was helpful. They all made it more difficult than it needed to be, and ANYTHING, I could do for her was the least I could have done. She was an angel; she already had her wings. We just were unable to see them. I just want my daughter, who has been forced to have a new dream, to realize hers. And then I’m done and I cannot wait to be. At least, just maybe, I’ll have some peace when I am permitted to be on the “Other Side”. As much as I hate it here and absolutely, except for my daughter, despise people, I don’t believe in going where you’re not invited. What I meant to add to you, Shreve, is that I hope you embrace your animals and consider yourself some damn lucky that your interaction with people is at a minimum, because, unfortunately, some of us are not so lucky. From the Outermost House by Henry Beston available for The Fund by Judge William Newsom. Love the picture. And nicely stated about working with animals better than people. I feel very much the same. That’s a complex “look” to pull off. You have a very emotionally mature horse there. The running style is intriguing. It means she’s also very physically talented. Her colts will be valuable. So sorry you feel people have such an ego problem. I know many who don’t and are wonderful friends. Many do let ego get in the way…just don’t ever get into the university scene as that is where ego dominates most…but not all.